Started with the next sprite. 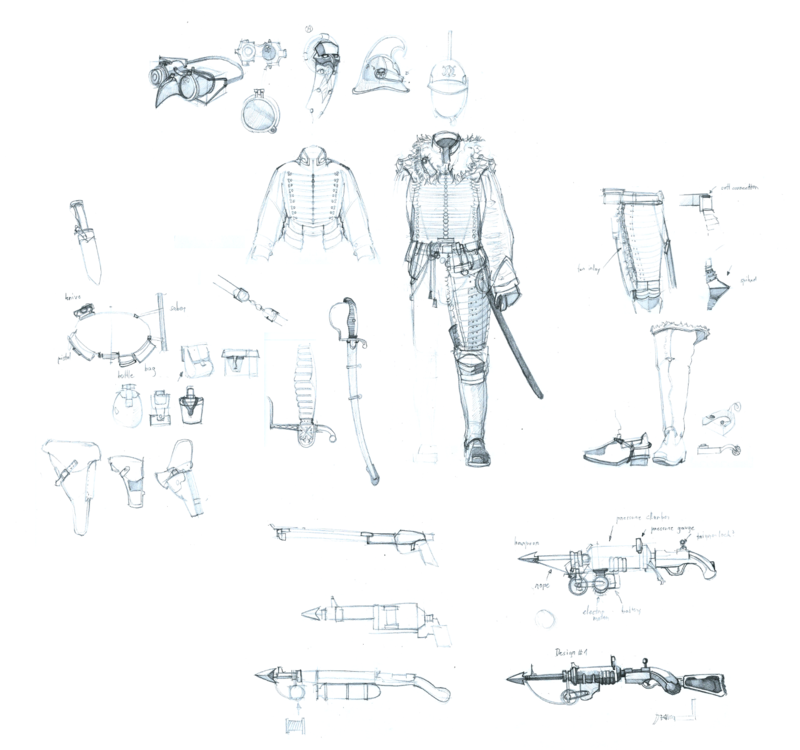 As in the description it will be the light cavalry, although I don#t have a concept art yet. This time as I have said in the last thread I started with digital posesketches. I made everything I usually do with pencil digitally, which was also quite an interesting experience, didn't took much longer, but already got a lot more adjustments compared to the pencil stuff. Also took the time to test and play around. so I rendered a relatively quick muscle figure, and adjusted the proportions similar to the crow. Here is the current first version of the render. I am unsure if the supportive and playing leg approach is good readable without the cast shadow. After overlooking it now after a break, I also think the rear uppe rleg (playing leg) should be longer. Also don't really fixed all line alignments so far, but looking on bigger critique for the overall pose (arm lengths/leg lengths/overall weighting). After oversleeping it a lot more issues were obvious to me. 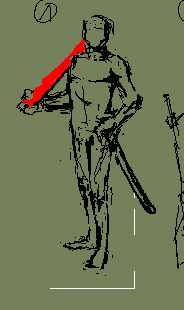 -changed the front arm, that he grabs his sword. -changed a lot of muscle detail stuff, mainly for practice. think the weakness at the moment is the bend playing leg. will turn it more forward and take out a bit of the bend later. 31 is definitely the most interesting pose. The rest look very similar to each other in terms of arm and leg placement. I like what you did with the legs in the first sketch; so I implemented it into my edit. 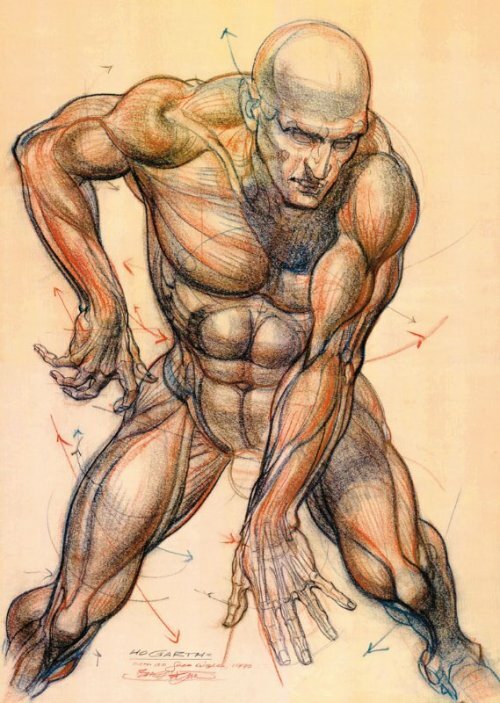 In all honesty, I don't think you should give much attention to perspective at all when it comes to figure drawing. It seems to be rather confusing than helping to you, in which case it's an obstruction. All you really need to keep in mind, with perspective that is, is that some crucial points (shoulder-line, knees, elbows, ankles, etc.) 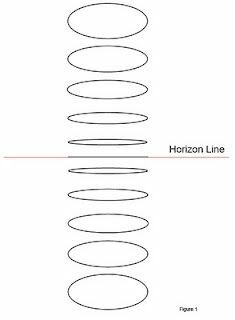 are aligned properly (and that is usually when they're static and not in movement; so like in my edit). I'm fascinated by how relentless you are when it comes to training. You're such a hard worker. And at the same time, you still make very very basic mistakes that are so easy to see. First : your body is totally distorted, especially the abs, while considering the pose, he should be very straight. Second : Your abs are far too much on the right, as if the character was 70° rotation (90° = profile). But you character is more at a 30/40° angle. Your left leg is too far on the back, and its muscles should have a lot of tension given they have all the weight on them. 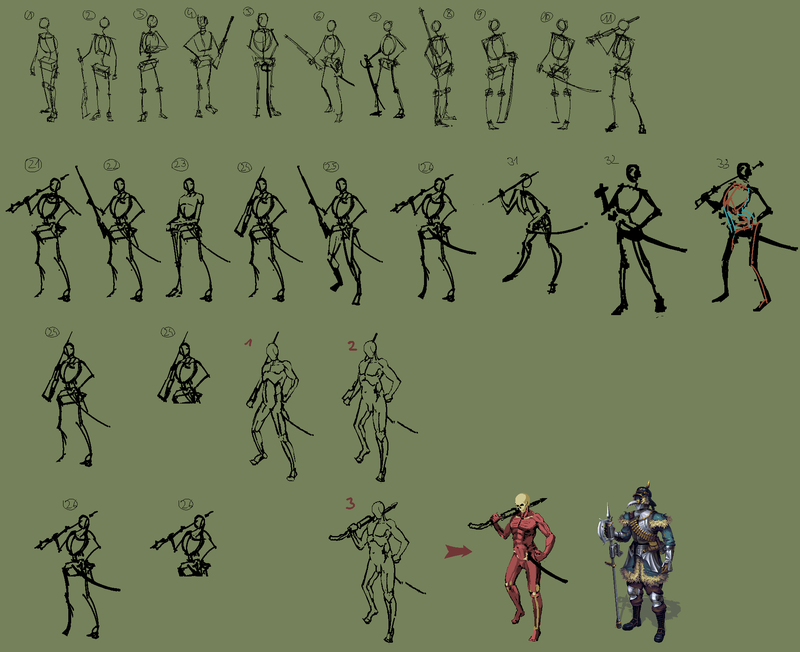 Agree with Night & Tim; the pose you chose is rather stiff and affected for something you've worked at and iterated so much (are you holding these poses yourself?). I actually find the doll construction thing a bit confusing for myself; quite hard to empathise/imagine yourself in the place of a weird box-doll. It does seem like a bit like you’re prioritising individual boxes/muscles and stuff and getting lost a bit at the cost of balance and a sense of the whole; you might try sketching a full body coffin-box (I sometimes prefer a cylinder) and then carving into that, finding important lines of action, or just free-handing with a scale of ellipses to reference for more organic stuff. I get quite a Burne Hogarth feel from your figures, particularly the older stuff; his ‘dynamic figure drawing’ is pretty popular but advocates some pretty odd-looking stuff at times (kinda like those big naked white guys from Prometheus). I guess my point is to try and downplay some of the compartmentalisation of muscles and stuff that you seem to tend towards and draw more from life if you can. @Night, made your pose, think it's not suited for the cavalry. I want to have something more aggressive and fiery, since I can't have the horse in there because of the perspective lines, the pose should give that feeling. It's a nice basic pose, maybe I will get back to it with another sprite which needs to have this silence and stiff attitude. I didn't gave any thoughts to perspective, within the first sketches, as soon as I start with illustrating it, well I have to apply it I guess. first: ribcage and pelvis move. Very basic anatomical mass shifts. Drawing everything stiff leads to liveless humans. Muscles move on top of hard bones and are flexible. The abs and the obliques are muscles which can chance their shape easily. Both are like bands. Then there is perspective applied to the collarbones and the pecs, so there has to be a distortion in lines. second: the body is not a square. the ribcage as well as the attached muscles shape an ellipse seen from top. the basic projection shows how much the forms you imagine in the frontview are actually distorted. A very basic beginner problem in terms of deep space drawing. On the other hand a lot of the muscles won't be visible since the figure is anyways wearing clothes, so at this stage it's anyways more about the positions of the limbs. The forms for the muscles is just roughly thrown in, to give some hints, I did it out of mind, for practice purpose. Don't have in mind to draw a fully detailled naked figure and the thick cloth on top hides a lot. Now I am really interested, why you think Nights pose is actually more dynamic. Also the way the gun is held in Nights sketch doesn't make any sense at all. I am restricted on really active figure poses, because if I will use them later in a chatbox, you can imagine what happens. And yeah, Of course I am acting in the poses. The groups of muscles usually get more natural once soft gradients are applied. If we jus thave clear cut big clusters it always looks technical, but as stated: won't be visible at all. The most important thing is for me to find the anchor points for the clothes. You could be reminded of Hogarth because of the overall proportions - I am going for idealized ones, not realistic ones. Quite Happy with the current positions of legs and arms. -couldn't use two of them next to each other in a chatbox because of the "crate"
Pretty interesting, could you explain what the terms mean and from what this sequence is? For the harpoon weapon it although might not be ideal, because it looked like the tip of the weapon would be pretty much hidden or invisible which is also a disadvantage for showcasing the design. I want to have a bit more active (aggressive and fiery) pose for the cavalry, as long as it meets the restrictions for chatterbox use. -legs won't be visible, but it has to look nice as a complete sprite. 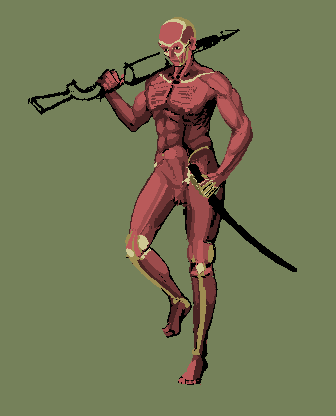 the current sprite isn't carefully constructed muscle wise, because I shifted and tilted a lot of parts in order to find a good position for the legs, I would have to reconstruct it from scratch to get everything alright. What's important right now is, if that pose reads good and looks believable enough. Actually more from the limb placement.